Lacking inspiration? 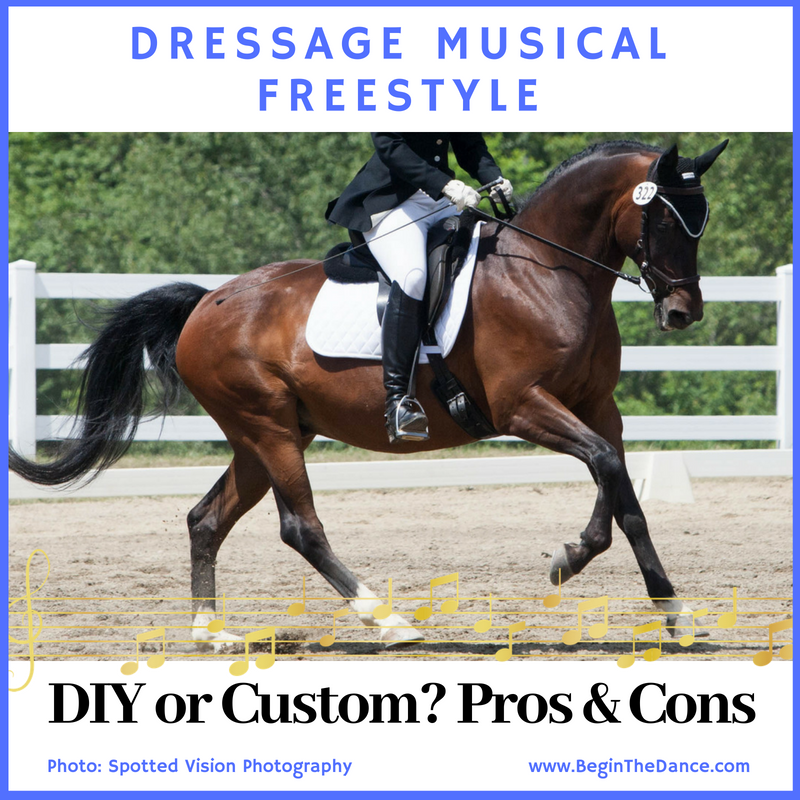 This post shares inspiring quotes about Dressage Musical Freestyle. 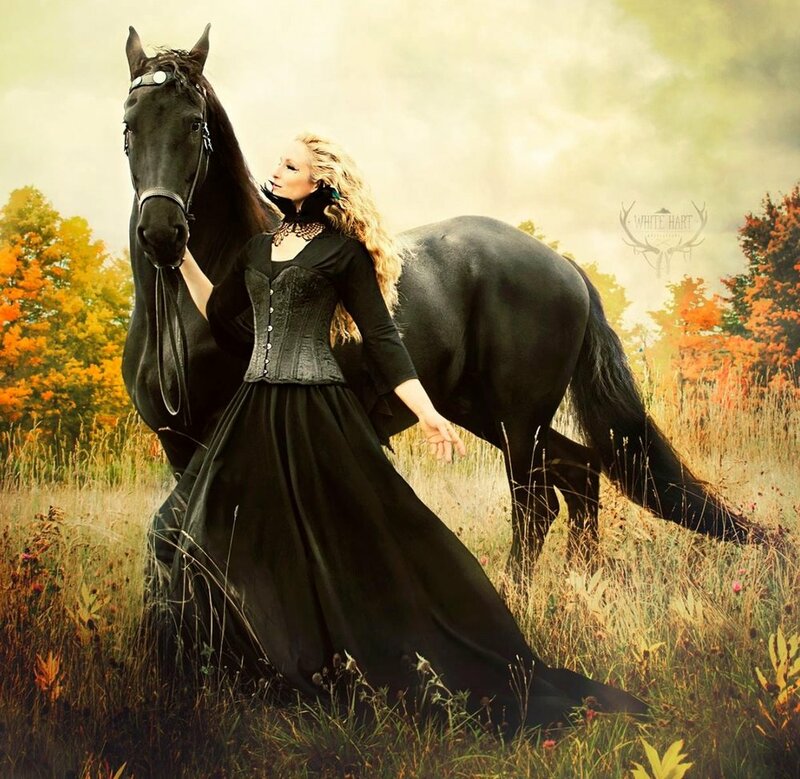 Get inspired to Dance with your Horse. Feel free to share with your friends, family, and audience on your social media accounts, Facebook page, Instagram, and Pinterest. 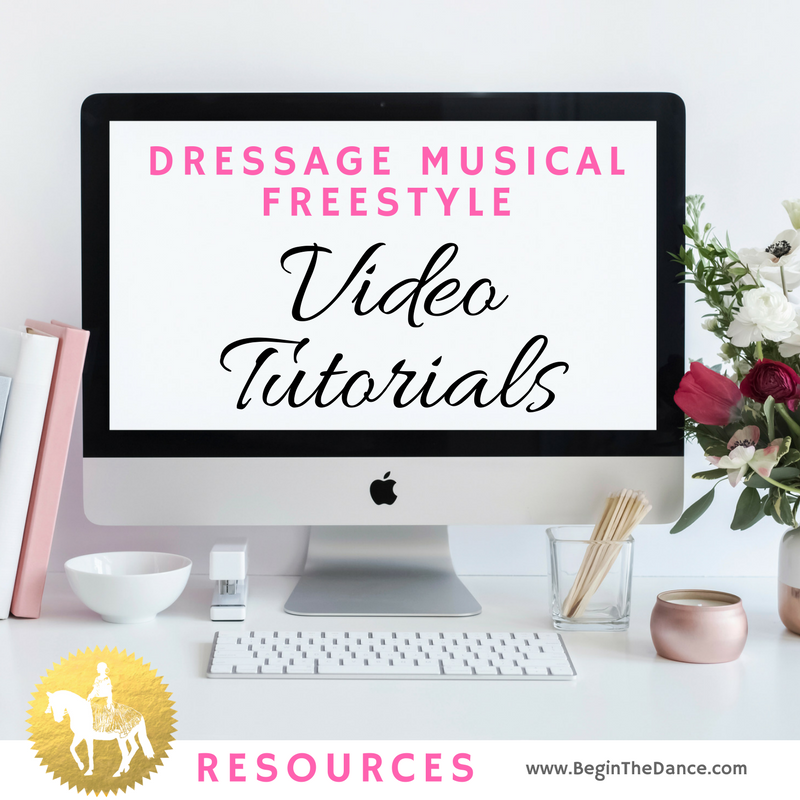 Learn how to create a dressage musical freestyle. Click here. After you have clarified your goals and defined a timeline for your freestyle you will need to decide the best path to choose. Do you have the time and energy for DIY freestyle or would you rather pass along the task to a professional? There are a variety of ways to complete a musical freestyle but for the sake of simplicity I have broken it down into three choices to narrow your focus. Creating a musical freestyle can be a very rewarding experience. On the flip side it takes a lot of time and energy, especially if you are new to freestyle design. Make sure to give yourself enough time to accommodate the learning curve that comes with the tech and choreography. Typically, I recommend 2-3 months at a minimum. I have broken down the process into seven phases in my eBook that guides you along the way. This is the route I see many adult amateurs take. They want to stay on a budget but are not quite capable, or confident, to put in the extra time to learn the tech side of freestyle design. Typically, riders will outsource the music editing because they are not familiar with the software. It is a smart decision considering the learning curve can be quite frustrating! Click here to take the guesswork out of choreography design. If you are a professional rider that is too busy with training clients and competitions, this is your best option. Adult amateur riders that are competitive and going to a lot of recognized shows will also benefit from a professional's touch. Every designer has a unique creation process and style to their freestyles. I personally am drawn to soundtracks that evoke strong emotions for the rider, the audience, and the judge. I chose music from the TV series Outlander for my Friesian gelding. When the entrance music starts my emotions change and it helps with my confidence. Click here to watch our Outlander freestyle. I hope that diving deeper into the Pros and Cons of each process has helped you decide on the best course of action for you. If you have any questions you can post them on the blog or email me at beginthedance@gmail.com. 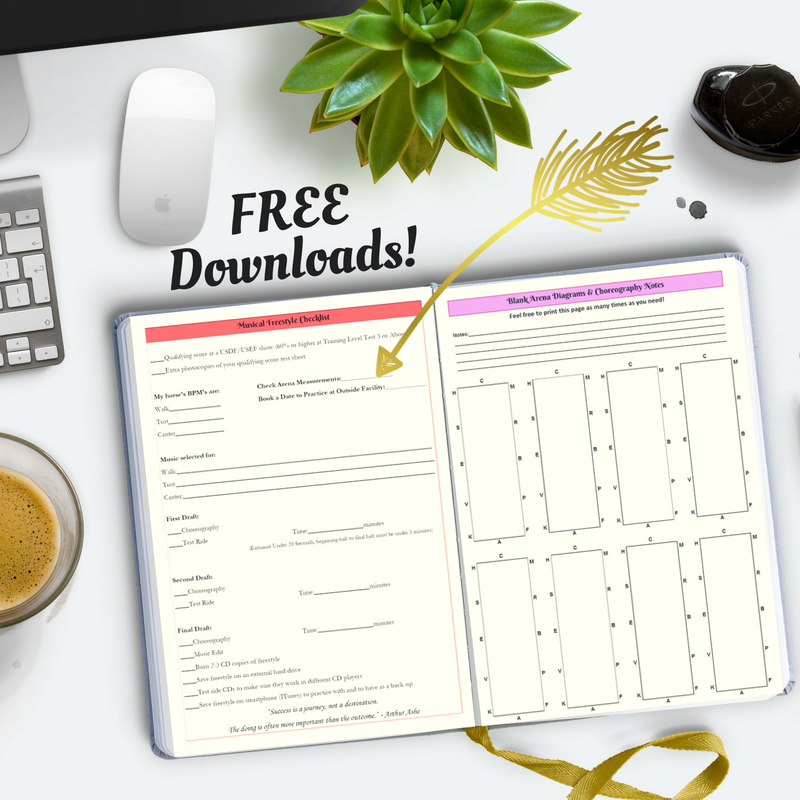 Stay organized with my Musical Freestyle Checklist and begin sketching choreography with my Blank Arena Diagram Page. Don't worry! Your information will be safely locked in the tack room. Learn how to create a musical freestyle from start to finish or choose an e-Book with choreography ideas just for your level. Click here to view all Freestyle e-Books. After you have clarified your goals and decided on a course of action, you will need tools and resources to begin your freestyle journey. The internet has made the freestyle creation process a lot easier, with more apps and tools being added all the time. Here are some popular apps that will help you will different aspects of freestyle design. Most of these apps are available on both iPhone and Android but I have only included links to the iTunes store. Send me an email (beginthedance@gmail.com) if you have found another useful app that you think I should add to this list. It is a good idea to have the freestyle tests available for quick reference. I check the tests to make sure I know the required movements for each level and to make sure I am not including anything that is forbidden. The app also includes the USDF Introductory Tests, which is helpful to have on your phone if you are teaching beginner dressage riders. Click here to download the USDF EquiTests 1 app. I use this app on a daily basis to help me find a horse's BPM (beats per minute). There are many BPM and Metronome apps on the market but this one also lets me check the BPM of a song while it is playing in Spotify. Many of the other apps I have tried will not work at the same time as you play a song. 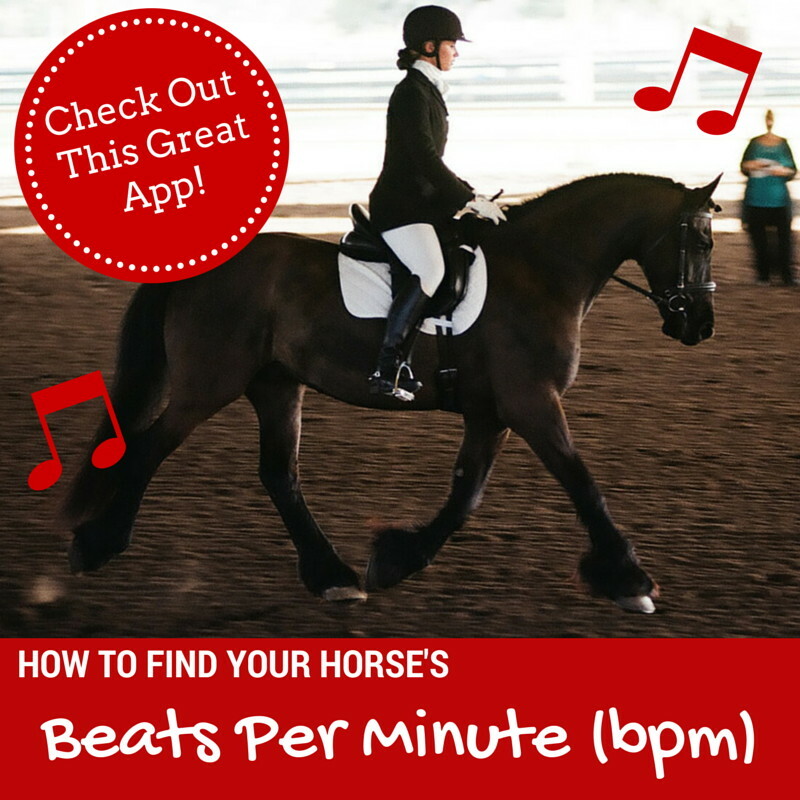 You can use this app to determine whether a song will match your horse's gaits, simple, quick, and easy! You simply tap the beat on the screen. When I use the app I start by tapping my foot to the beat of the song and then tap my finger to help me keep a consistent rhythm. Click here to download the BPM by Cheebow app. This metronome app came highly recommended by a member of the Freestyle Facebook Group. I have since downloaded it to my iPhone and I will test it out myself. You can simply tap the screen to start/stop the metronome and set a visual flash of light if you can't hear the beat. It also has a BPM detector that may also be useful to figure out the BPM of a particular song. This app is meant for musicians and has additional features to tune instruments and record music. Click here to download the Soundcorset app. This is a metronome app meant specifically for riders. You can use this app to help you determine your horses's BPM's but it works differently. Instead of tapping the screen you will set the tempo and keep adjusting it until you and your horse are in sync with it. This app is helpful for riders that have a hard time keeping a steady tempo. Once you figure out your horse's BPM's you can set the tempo and practice keeping it steady during your ride. Click here to download the EquiTempo app. I have not used this app personally but I have heard positive reviews from students. This app is helpful for choreography, letting you draw movements and save your routine on your phone. This would be useful if you have an idea for your freestyle but are not close to a pen and paper. Let me know if you have tried this app and how you like it. Click here to download the EquiSketch Dressage app. I love using Spotify and I recommend the paid version. You can use Spotify for free but it does not let you click through songs quickly, you have to wait and listen to ads. If you just need the app to help you for a one-time freestyle you can just use the free version. I save numerous playlists for walk, trot, and canter songs so I can go back later and find something for a new client. I also create playlists for each horse/rider combination and for my own personal horses and themed performances. Spotify will also recommend songs based on your personal preferences. This has helped me discover new music that I wouldn't have found on my own. However, it is easy to fall down the rabbit hole and listen for hours! But I don't see that as a big problem do you? Click here to download the Spotify app. Do you have an app you use for musical freestyle? Please leave a comment below, email me at beginthedance@gmail.com, or join the Facebook group and share with the other members. Creating a musical freestyle takes time. You may begin the process all gung-ho and then find that your motivation lessens as time passes. So far on your freestyle journey you have clarified your goals, decided on a course of action, gathered your resources, found your BPMs, and started the music search. Whenever I feel a lack of inspiration I spend some time doing the following. I would love to know how you stay inspired. Please share in the comments below or with the Freestyle Facebook group. If you have the opportunity to attend a live event I think that it can help spark motivation. Even a local schooling show with one freestyle can motivate you. Watching a fellow rider in the ring, showing their finished freestyle is encouraging. Sometimes the lack of entries is also inspiring, it confirms the fact that creating freestyles is a lot of work and it means that your freestyle will stand out from the crowd. Make plans to attend a big show if you live near high-profile showgrounds like Saugerties, NY or Tryon, NC. Are you making plans to attend the World Equestrian Games coming up this September (2018)? Regional and National Championship shows typically showcase the freestyles in the evening for the enjoyment of the audience. This is by far the quickest way to get motivated and inspire new ideas. I have saved individual Playlists for each level, Training through Grand Prix, and would love your help to add more. If you want to inspire other riders please send it along. Click on the freestyle level you are interested in seeing, the link will take you to my YouTube playlist for that level. If you have a video you would like me to add, please post the link in the comments below, email me at beginthedance@gmail.com, or post your video in the Freestyle Facebook Group. I would love to share your finished freestyle, it doesn't matter if you are starting out at Training level. When I am feeling down I jump onto Pinterest and start searching for motivational quotes and sayings. There aren't that many quotes related to musical freestyle...believe me I know! That's why I have created my own using quotes related to dancing, music, and riding. Click here to browse my collection of quotes here on my website or you can follow my Dressage Musical Freestyle board on Pinterest. Being a part of a group of like-minded riders is helpful to stay inspired and get encouragement. I started a Freestyle Facebook Group specifically for riders that want to ask questions, share their journey, and receive encouragement along the way. It is a positive group of ladies, many of them I know in "real life" too! Click here to join. You can also join a few other Facebook groups called Musical Freestyle (Dressage Kur) and Musical Freestyle Dressage. There are also two online forums that you can ask questions and interact with other members on the topics of musical freestyle. These are the two that I recommend, the Chronicle of the Horse Forum and the Definitely Dressage Observation Lounge Forum. If you find any other fun, positive groups online please let me know in the comments below or email me at beginthedance@gmail.com. I hope this post helped you find some motivation to continue working on your freestyle. Don't worry, everyone gets stuck, I think it is basically a right of passage! When you are struggling through the third, even tenth edit of your freestyle music it can feel like it is taking forever! Good luck! Now for the fun part! This is usually the part of freestyle creation that everyone seems to enjoy. Searching for music can be exciting. However, it could be overwhelming if you don't know where to begin. That is what we will focus on today. 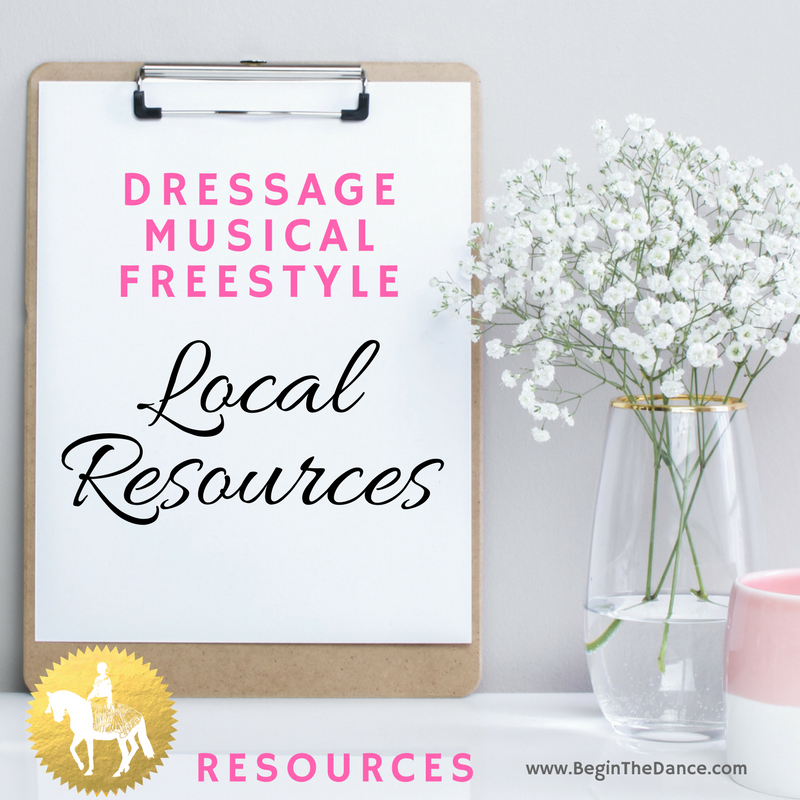 Before you search for your freestyle music you will want to clarify your goals, decide on a course of action, gather your resources, and figure out your horse's BPMs. By knowing your horse's BPMs you will spend less time on your music search. You can use a smartphone app to check songs on the fly, save songs on an app like Spotify, and shorten the amount of time it takes to find songs for your walk, trot, and canter. You might already have a particular band, song, or soundtrack that you are particularly fond of. If you starting from a clean slate, use this list to help you brainstorm ideas. Your horse's breed might lend itself to a particular genre of music. Think about where your horse's breed originates from, and the history that goes along with it. If you ride a Mustang you might choose music that sounds like the wild west or a movie soundtrack like Spirit. If you ride a Baroque horse (Andalusian, Lusitano, Lipizzan) you might like classical, flamenco, or spanish style music. Riding to popular movie soundtracks will engage your audience/judge, reminding them of the emotions they felt when they watched that movie. I chose music from the Outlander soundtrack for my Friesian horse Douwe. I love the T.V. series and I was lucky that the music matched his gaits. Click here to watch our First Level Freestyle that has over 9,000 views on Facebook! Is there a particular song on the radio that you just love? Lyrics are discouraged in the show arena (unless they lend a special quality to the performance) but you can find a variety of cover songs and remakes online. Search the song name on ITunes and Spotify and you will typically find instrumental versions. Some of my favorite groups that create instrumental songs from modern music are Vitamin String Quartet, Eklipse, and The Piano Guys. You can also find remakes of your favorite songs from the 70s, 80s, etc. Are you a huge fan of the 80's? Maybe you love classical music and opera. There are so many genres to choose from. Narrowing it down to one genre may not be as specific as a particular band but it will be a great start! When you think of your favorite style of music keep in mind how it makes you feel. Gravitate towards music that gives you confidence and keeps you focused, some music can create a lot of excitement that might translate into tension at a horse show. If you haven't started already, I hope this article inspires you to begin your music search. Putting together your own musical freestyle is a challenge but well worth it in the end. After you have clarified your goals, decided on a course of action, and gathered your resources, you will need to figure out your horse's BPMs. I get asked about BPMs (beats per minute) frequently from riders who need help finding freestyle music. They know that they need to figure out their horse's bpms but aren't quite sure what that means or how to go about it. It is actually quite simple once you give it a try. I have included a few different methods, hopefully one of them will work for you! Every piece of music has it's own beats per minute. When you match your horse's bpm to the music's bpm you can feel confident that the music will match. Of course, there is more to it than just matching the bpm (picking a theme, matching personality, and whether your horse enjoys it as well) but is a good place to start. Start by wrapping one of your horse's front legs with a colored polo wrap. You only need this one wrap but the leg will show up better in a video if all the legs are wrapped with just one that is brightly colored. Learn how to find your horse's BPMs for your musical freestyle. I suggest that you warm up first so that you can be sure to have the best representation of your horse's working gait. Every time that front leg touches the ground at the walk or trot, you will count it as one “beat”. At the canter, you count the leading foreleg as one “beat” when it strikes the ground. Using a stopwatch or the timer on your cell phone, have your assistant set the timer for one minute. Have them count the number of footfalls (of that one foreleg) while you ride your horse in a consistent working walk, trot or canter. As long as the horse stays steady and your helper is a good counter (haha) you will have your bpm. You may want to take an average after multiple tries. Have your ground person use a metronome app on your phone, adjusting it up or down until the “beep” sound of the metronome matches the footfall of the wrapped leg. Some good apps to try are EquiTempo and Metronome. Have your ground person use a BPM app, tapping the screen every time your horse's front leg touches the ground. It will give you the average bpm within a few strides, try it a few times to double check consistency. I have been using the BPM by Cheebow for many years. Take this opportunity to have your assistant video your horse at a consistent walk, trot and canter. Make sure to include your working gaits and lengthened/extended movements. Stay in each working gait for at least one full minute. You can count the footfalls from the comfort of your own home on your computer. The video will also be helpful for you to test out different pieces of music. *Generally the canter is twice the beats of the walk and the trot lies somewhere in between. 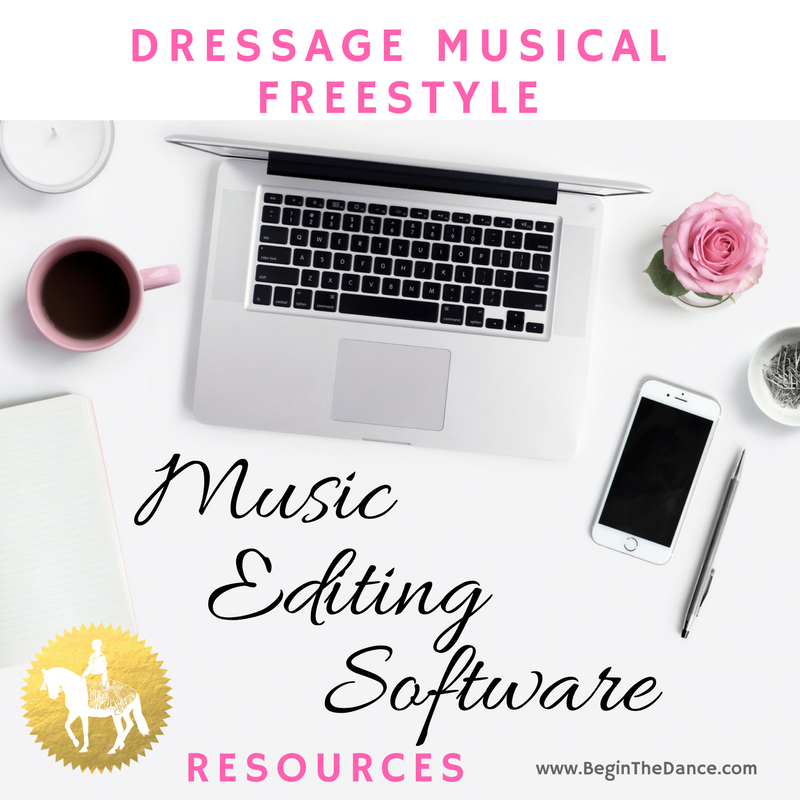 What Computer Software Should You Use to Edit Your Dressage Freestyle Music? After you have clarified your goals and decided on a course of action, you will need tools and resources to begin your freestyle journey. The internet has made the freestyle creation process a lot easier, with more programs and tools being added all the time. Here are some popular programs that are used by amateurs and professional freestyle designers. Send me an email (beginthedance@gmail.com) if you have found another useful program that you think I should be added to this list. > Garageband My current software of choice. It is easy to use and works seamlessly with ITunes. Only available on Mac. > Audacity Probably the most popular FREE software that will work on all computers. > Logic Pro X The next step up from Garageband. Only available for Mac. > Adobe Audition Creativity in the cloud, there is a monthly fee but you also have access to other Adobe programs. > Music Maker Previously known as Sound Forge, was bought out by Magix. They have a free trial to use the software. I regularly save freestyle videos and tutorials on my YouTube channel. If you find a video that I have not saved to a playlist please send me an email (beginthedance@gmail.com) so I can add it. In addition to online resources, I encourage you to look into options that might be available to you locally. > Family & Friends: Perhaps your son is really good on the computer? Check with your horse friends and see if any of them are tech savvy. Maybe you could barter some riding lessons for their editing skills! Be creative! > Local High School: Meet with your local music teacher to see if they have the ability to edit music. Your school may have a computer class that could include your freestyle as a class project. > Nearby University: Pay a college student to edit your music. Try posting a want ad on a local community board or coffee shop where the tech-savvy folks hang out. Some college student would probably appreciate the opportunity to earn a little extra money. > Professional Musician: If you know someone who records their own music they will certainly have the skills to edit music. Check out some local bands in your area. Don't worry about the genre of their music, it is the editing skills you need. > Freestyle Designer: You can reach out to a few professional freestyle designers and see if they would be willing to edit your music separate from the choreography. Most designers want to be involved in the entire process or they may have suggestions for your music choices and choreography. Lacking inspiration? Perhaps you need a little push in the right direction. This post shares 27 success quotes for EQUESTRIANS. Feel free to share with your friends, family, and audience on your social media accounts, Facebook page, Instagram, and Pinterest.